Ambagamuwa PS Chairman Jayasanka Perrera and PS members removing posters. Picture by G.A. Gunasena, Ginigathena Special Corr. 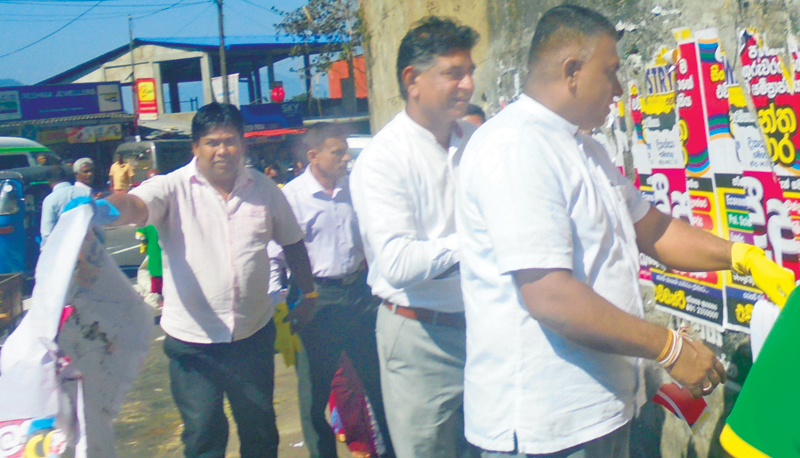 A programme to remove posters in the Ginigathena town, was inaugurated by the Ambagamuwa Pradeshiya Sabha (PS) under the patronage of its Chairman, L.P. Jayasanka Perera, on Wednesday. Ambagamuwa PS members participated in the project. The PS Chairman said that under the programme to clean cities in the Central Province; initiated by its Governor, Maithree Gunaratne; the Ambagamuwa PS had taken steps to clean the Ginigathena town by removing posters and cut-outs. “We will set aside two places in the Ginigathena town for the pasting of posters; it will not be allowed in other parts of the town,” Perera said. “Legal action will be taken against those who do not follow this rule,” he added.